Niigata, Japan, October 10, 2014 – Japan managed to get their first win under new coach Javier Aguirre on Friday, but the 1-0 victory over Jamaica at Niigata’s Big Swan Stadium was underwhelming at best, with the goal coming from an unfortunate defensive mishap. To be fair to Aguirre, he’s still looking for his best lineup and against Jamaica he mixed some of his more experienced stars – Shinji Kagawa, Keisuke Honda, Shinji Okazaki – with a bunch of relative newcomers: Tsukasa Shiotani, Masato Morishige, Gaku Shibasaki, Yoshinori Muto. Obviously, this wasn’t his best lineup. His formation was initially 4-3-3 with Hajime Hosogai as the sole holding midfielder but looked more like 3-5-2 in the second half. Not that it made a difference. Honda danced around like Honda does, Kagawa was back to his Japan/Manchester United mindset, Shibasaki was largely ineffective in the playmaker’s role and Muto couldn’t cut it up front. Yuto Nagatomo and Gotoku Sakai put in some random crosses from the wings to no effect while Shusaku Nishikawa had virtually nothing to do in goal. Morishige was OK in the middle of defence while Shiotani didn’t put a foot wrong and was the only Japan player to really shine on the day. Jamaica tried their best and at least gave Japan a physical test, but in terms of technique and quality they are way down the totem pole. They would have done better to have tried to pressure Japan with Route 1 football rather than try to out-finesse their technically superior hosts. Sometimes primitive works. So Japan weren’t likely to lose the game, but they still struggled to win it. Japan looked slightly more convincing early in the game. Muto had a good chance in the fourth minute but wanted too much time, while Honda forced Jamaica keeper Ryan Thompson into a great save from a smart free-kick in the sixth minute. Kagawa came up with a rasping 30-meter bomb on the quarter-hour mark but saw it flash past the post. But a minute later, Japan were in front. Shibasaki got the ball on the right of the box and delivered a low ball in that Thompson could only parry against Nyron Nosworthy and the ball ran off his body into the net from a few meters out. Jamaica made some good saving tackles in the game and Jermaine Taylor did brilliantly to stop Honda in the 23rd minute. Sakai cut in well before unleashing a 25-meter shot in the 25th minute, but it went straight to the keeper and the full-back then set up Honda with a golden chance, but the AC Milan midfielder scooped the ball onto the bar as he tried to lift it over the keeper. Okazaki had two attempts just before the break, including a reasonable overhead kick, but neither troubled the Jamaicans. Jamaica brought on Michael Seaton and Darren Mattocks for the second half but still struggled to threaten the Japan goal. Japan, meanwhile, continued to create chances and continued to waste them. Muto misfired on three occasions, while Okazaki tried hard but couldn’t find the answer either. After Kagawa sent a side-foot shot wide in the 65th minute, Wes Morgan saw a header loop onto the top of the net, while a 25-meter effort from Je-Vaughn Watson didn’t get near the target. Seaton followed up with a nice run at goal but couldn’t find an end product. 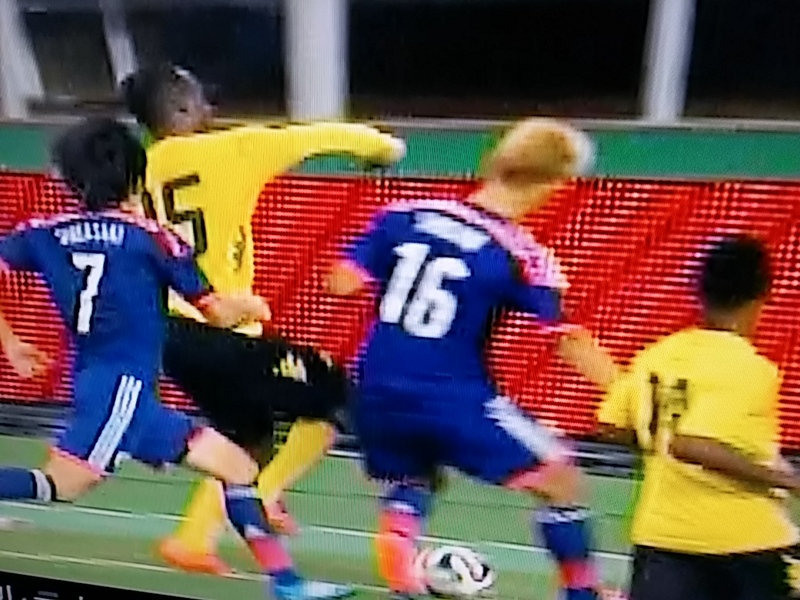 Another great tackle – this time by Morgan – prevented Kagawa from extending Japan’s lead and Thompson did well to stop Yu Kobayashi’s shot on the turn in the 72nd minute. Nagatomo tried to gift Jamaica a goal in the 79th minute with a suicidal back pass to the unmarked Lawrence but the Jamaican wasn’t sharp enough to take advantage of Nagatomo’s gift and Morishige came in to clear the danger. Three minutes after being booked for a foul on Hosogai, Watson escaped a red card after back-handing Shiotani in the face, but the ref didn’t see it; most likely he’d fallen asleep, too. There was little to celebrate for either side in this dance of under-achievement. Japan would do better losing to better opposition, as they probably will when they face Brazil in Singapore in four days’ time. This entry was posted on Friday, October 10th, 2014 at 10:40 pmand is filed under . You can follow any responses to this entry through the RSS 2.0 feed. You can leave a response, or trackback from your own site.